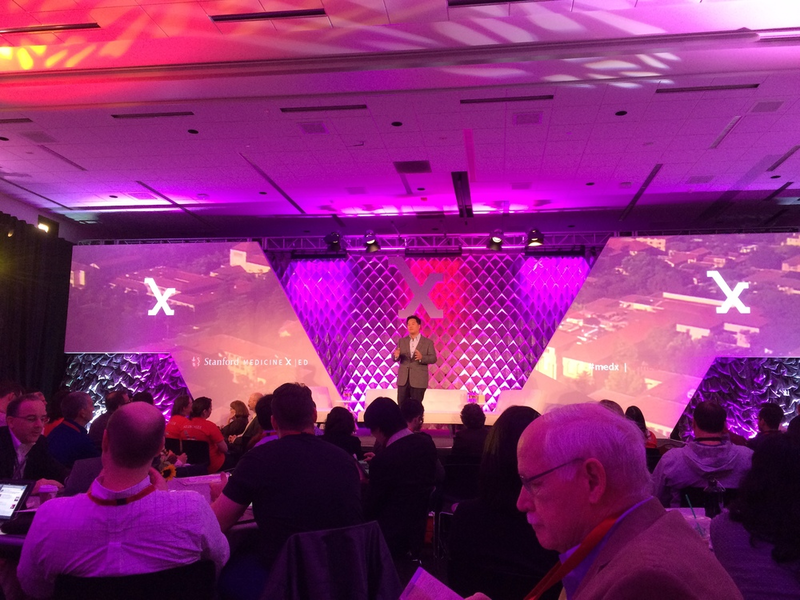 So this is going to be my attempt to take notes and live blog my experiences to the MedXEd Conference at Stanford. In all honesty, I'm greatly excited! This will be my notes of my experience, and some musings. I will condense it in the future. 7:54AM: Lights are darkening and now the intro video is playing, bring on the inspiration. Yay Coldplay (You're a Star)! The story snippets are quite interesting to say the least. 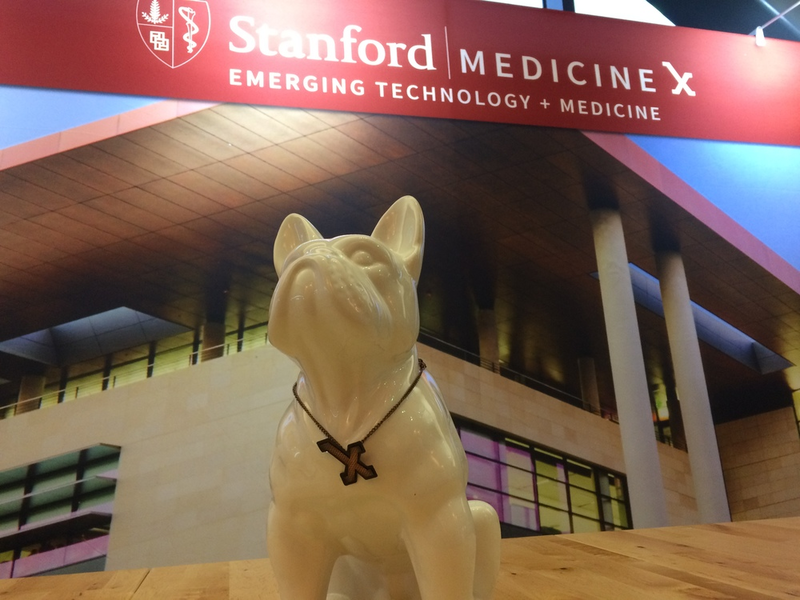 7:58AM: Hello Zoey, the MedX Mascot. Was wondering what the dog was! The video introduction to the day for announcements is really well done I must say. I wonder how much goes into the production of this event. I like how they are pushing for collaboration. And the push for engaging social media is really a positive item! 8:01AM: Stanford Anesthesia now introducing Dr. Larry Chu for the meeting! Gonna take some notes on what he says (note I probably am going to miss some items): Its been 4 years since the conference launched on the intercession of digital and medicine and healthcare at large. Now the most discussed medical academic conference in the world. 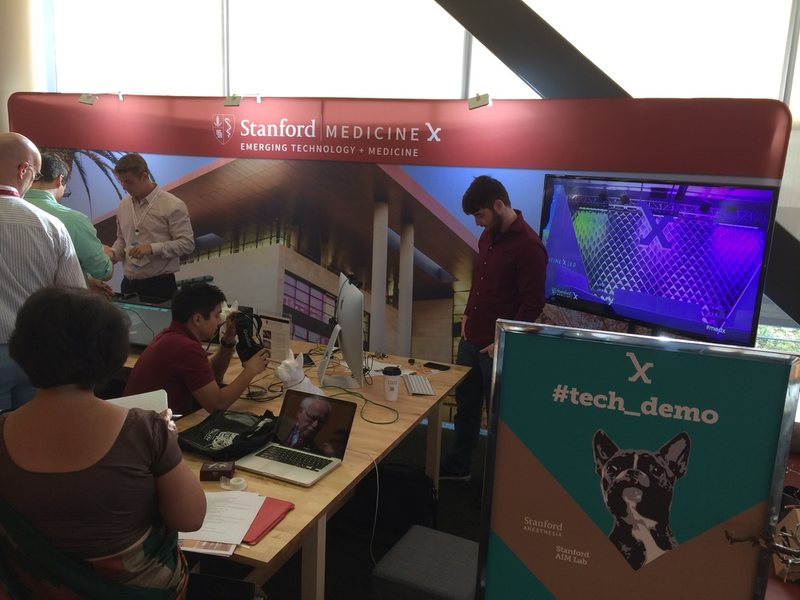 Stanford MedXEd is the newest conference venue off MedX to explore an area in desperate need of disruption: Medical Education. I would argue that healthcare education in all a professions can equally benefit. To integrate new technologies into patient care of tomorrow relies on the teaching of todays up and coming practitioners. WE are teaching in silos. REAL healthcare is not siloed but collaborative and with a global community with diverse stakeholders. Empathy and innovation rarely happens in a vacuum. We are in a room of educators, technologist, industry representatives, students, pharmacists, providers, nurses, we need to learn from each other and learn. Be uncomfortable, humble, and co-create the future of Medicine Education. How might we rethink the way medical education is done? How might we use the modern affordances of technology to engage new learners? There is going to be alot of 'How might we..." ideas I feel across the next few days. My goal is to see how we can use this in pharmacy education. Theres going to be alot of themes, from perspectives of students to patients, with speakers across the world. I am excited for Theme 5 on lifelong learning. Larry is wrapping up the introduction, and giving thanks to advisors and members. I think its amazing how much this event has grown over the years. Bertalan Mesko's new Book "Medicine Upgraded" is book of the meeting. Good Job! Now on to the main events! Keynote time! 8:15AM: Opening Keynote for the inaugural MedXEd conference: Cancer survivor and author Howard Rheingold (@hrheingold). Notes as follows on his talk: Some may date virtual communities back to 1999, but Howard goes back 30 years, with the purchase of his first modem ($5!!). "Virtual Communities" by Howard Rheingold - Whole Earth Review Winter 1987 (I need to find this!). Story on how his daughter had a tick, and his wife called the office pediatrician and waiting for callback. But Howard went on the 'well' online and reached out the online community. A physician online got back and helped instruct to get the tick off before the physician on call got back to them. This is an interesting story from a time where I was only a few years old! Discussing early forms of support group online made up of survivors, physician, nurse all in 1985. Unfortunately, cancer claimed a life, but people showed up that only knew the patient from online. Now discussing his own experience with cancer. Started a Tumblr on his experience. Writing was cathartic and helped to deal with fears, pain. Social media really helps those that they may not meet IRL to find support. Really great for those with rare diseases (which I think is a big strength of online communities such as PatientsLikeMe [PLM]) and the ability to 'Google.' People becoming more informed and more misinformed (Digital health literacy callout - Everyone is an expert online). Callout to participatory medicine (Society of Participatory Medicine) for patients and for healthcare professionals to get into. E-Patients or Connected Patients. Yay! Now he is talking about PLM. Clinical trials, and example with Lithium. (If you havent seen it, look into how PLM is teaming up with the FDA and Walgreens!). CrowdMed shout out for crowdsourcing disease treatment. Technology helps us crowdsource solutions and diagnoses. 'The e-patient is also a networked patient.' Amplified by technology and information sharing. Peer support is important (and sometimes I think this is something tech cannot change, and why 'soft skills' are needed in the next generation of healthcare providers that are heavily invested in digital technologies.) Futurist indicate driving forces is online searches and the issue of uncertainty. How accurate and trustworthiness is this information? We have the opportunity to shape that. Pitfalls of E-Patient: Cyberchondria, BadInfo (crap detection failure) - can we separate bad and good information from each other. Overconfidence - so well informed that they dont know what they are talking about (Mark Twains quote comes to mind). E-Patient Opportunities: Education (good for patients). Learn (example of early HIV/AIDS patients experiences when they knew more in the beginning than healthcare practitioners). I think bringing this all together is the focus that the patient is key and the opportunity to amplify your knowledge through support networks. Where does this go in the future? There will be only more medical information online (Google is going to give approved pages on health information). O, neat idea, health webrowser - Could it be an extension for Google Chrome I wonder? Don't let natural sceptism become your natural default. Good keynote! I really enjoyed it. Time for a cofee break. Glowsticks time! Start back at 9:10AM. Coffee Break Time: Well, this is cool, some companies are doing tech showcasing. Fig 1 is here! Just talked to them about making a section for drug-induced reactions and side effects, would love it! I also met Kelly Gringrod, a favorite of mine from Twitter! It's amazing to finally meet and chat face to face!. 9:10AM: Time to move on to first session. "Autonomy, Access & Patient Engagement." Interesting story on adeptness of patients with technology shame and embarrassment with the use of technology. How are individuals struggling with VRI? How are students being taught to engage with patients with disabilities? The national association of the deaf put together a list of concerns about VRI with patient outcomes in care. What litmus test is there for patient success? Deaf people having the right to decide and engaged in medical training/programs. There are a number of physicians nationally that are deaf and hard of hearing. Students with issues in hearing also have difficulty in schools. Many are denied schooling. Minimum access does not equate to patient autonomy. Engagement/Education/Ensuring - are these available to patients, and could be a litmus test for communication means and success of access for patients. Recent story about his experience at the clinic. Waited an 90mins for the clinic to find a computer for VRI, even though did not want it. Failure to engage with patient on what they want/need. Good image example of mazes. Navigability and patient autonomy for patients and their care. Note: This is the first time I've seen a presentation given with sign language interpretation. Very inspiring. 9:22AM: OSMOSIS. I remember looking at this app when came out with iMedicalApps. Nice to see how far they have come. "Learning is misunderstood" - nice quote. THere are more analytical power in helping you find what show to watch on Netflix than helps you what to learn in education. I'm not going to go crazy taking notes on how Osmosis works, but those that are interested I recommend going to their websites and watching their videos. My personal question is how to expand this services and material outside of a medical school and into the pharmacy schools. This is key especially with the big push for case-based learning for pharmacy education (especially in therapeutics). Space repetition being discussed. If you are continuously get reminded on material you remember longer. Also, memory association (this persons name is "Baker' vs this person is 'a baker'). 9:28AM: Dr. Khullar talking about empathy and the importance of sitting with patients. While listening to a patient talking about their life so much going on, and did not return to talk to the patient later, even though promised. Acknowledges no excuse. Vowed to spend extra time with the patient the next day, but the patient died overnight. I like how he talked about his mind rushing on what is going on and what he needs to do. A checklist oriented mind. Wonder if mindfulness would help in these situations. Empathy efficiency tradeoff versus a business minded health institution. Average patient spend 8mins with a patient. Less time than walking around or documenting. There is a dissociation with patients now. I know many pharmacists that wish they could spend more time with patients than just dispensing. I think this issue goes just beyond the hospital, and into the clinic, and other health institutions nationwide. We don't have alot of time for compassion. Good story, really enjoyed it. 9:33AM: These millennial learners. I can relate as a millennial educator and practitioner. I like how she is starting with a case. Information is taught as indisputable fact. Hard to draw conclusion or inferences from facts. So why do we need iron for hemoglobin? Many students are turning to humanities to learn (especially in pre-med). Humanities versus sciences. Creativity is important. Ive heard some students express this in other institutions about the teaching of medicine and science and that students learn to think on own or that creative aspect. We need to encourage students to apply what they learning to real-life situations. Encourage creativity. Bring back the identify of me/we to the work. Increase problem analyzing skills. What do I know about this problem versus what is the answer. Increase creativity to learn and critical thinking. 9:40AM: Time for the panel on Millennials.Really enjoying this chat and how students are seeing what their struggles are. What's interesting is my experience 5 years ago in school and those now coming in and their struggle. Students are very different in such a short amount of time. interesting to see pre-med, student, resident, new practitioners. New MCAT has different emphasis on different information. Interdisciplinary approach going on. How do we get residents and fellows to learn throughout the day and not get burned-out in early practice. Pre-meds are using the content they are given (videos/materials online), but while studying for MCAT turning to online material to helping to learn. Alot of self-foraging it seems. Shouldn't we be teaching students better foraging skills? I like the call out to Khan Academy. Purpose of medical school is to interact with patients, and that we can tech to learn online. More flipped classroom, less didactic teaching. Captioned videos, why not more accessible technology can learn from? What tech can we give students? YouTube captioning = Crapshoot. Knowledge isn't so patriarchal but rather crowdsourced between students. Students are being creators and curators. Can we collaborate between professors and students. How accurate is the information students are finding? Good example: Wikipedia. Good shoutout that we need interdisciplinary education for students to prepare them for real-life practice. I would like an interdisciplinary panel though, where are nursing students, pharmacy students, PA, PT, etc. Note: Depending how you interpret what the panelist are saying, it can sound insightful or complaining. I think this is the struggle with the millennial generation. Break Time! Getting to meet people I've only seen on Twitter! 10:20AM: Video time. Accidental doctor. Love it. The importance of Design Thinking. Student from Amsterdam. "The Art of Medicine." How art can be an additional source of communication. "Hacking Healthcare" using art students working with med students to learn from each other, on empathy and knowledge and other sources of information from patients. Love it. Students learned to see healthcare has lots of opportunities for design and art. The assignment to humanize the psychiatric care. Alot of work through experience to foster more human contact between staff and patients. Use design and art in care. 10:48AM: "Lecture Halls w/o Lectures - A proposal for medical education" NEJM. This section is about rethinking the medical school. No more "Sage on the Stage." Other article of "Medical Education Reimagined: A call to action" Academic Medicine 2013. Knowledge is science based, interactive, compelling and pt-centered. Based on a Minimum Foundation and 'Evergreen" then interact in 'deep dives' via labs/bedsides/movies/patient care. Experience = true learning. RWJF is reimagining medical education in a flipped classroom manner. Centered on medmicro and ID. I am liking this talk, really good walk-through. I think worth seeing how we can use this in pharmacy education. Bring the patient in the middle, with the science and case. Narrative and springboard videos. <10mins in length. I really like the snippets that is modular and can be adaptable for the curriculum and any changes. "The one world School House." Look into it. 11:00AM: This is a different talk, on a different approach to creativity. Failure is sometimes good. Getting people together to make money and do good for the world. "The biggest missing workforce in health is the public" Susannah Fox shout out on peer-to-peer healthcare. 2/3 or health problems are in the home. Not in the clinic or the hospital. Stories trump data, relationships trump stories, individuals trump organizations. Evidence Based stories are key. His work is similar to the work on YouTube by those that draw on whiteboards and tell a story. Infographics are good. Whiteboards are just one small nudge (I like the fly/urinal example) for better patient outcomes and teaching and changes in incentives. Authenticity is key to get engagement, trust, and buy-in. Expect failure (but financially I wonder how much your allowed to fail). 11:15AM: Superstar panel time! Often times those leading the way are disrupters. "Teach me how to Teach" Learn the language of medicine. Learn to speak and translate it to patients to appropriately engage them. Where does the hospital end and the rest of society begin? One panelist is encouraging physicians to go into the community and 'be that patient' through experience and visualization. Think home health care has some value here, and harkens back to the era of the black bag visiting physician seeing the patient in their home. "Parody Error" - Ept Dave is how do we engage pts to do things, his stance is how do we get medicine to listen to us, and keep the patient the center of things. Shoutout to Health Literacy Missouri for consumer friendly terms - "Clarity is Power." Some patients, not all, are willing to help. Jumping ship now to about the educational gab between students and practitioners. Analogy of the bridge, that as the med student crosses the bridge to a practitioner, remember that you came from a side patients are on. Patients are now helping to interview on future medical students - thats really interesting! Patients are helping with the curriculum design. Pts are encouraged to fill out student evaluation forms for student assessment. I love the line about patient care "There is no cure for IBD... The patient says can you add 'Yet'." Dave adds that pts want an end to symptoms, which is what the patient wants and not necessarily a cure for the disease. Living with not cured. Now turning to student who has a startup, what support did the medical school give him? What support do we give learners who are innovators. Joke "Stay out of my way." I think this echoes Christina Farrs article about drop-out medical students. Hacking healthcare vs hacking university. Kinda an interesting thought, what room is available for start-ups to change the way we teach I wonder? O, I like this analogy, that the student is the user, and similar to how businesses are focusing on users/customer, then that the user is the first case for a user friendly design (UX/UI). We really want radical ideas and innovation. Advice on innovation: Get paid by a bunch of people for same product (university, hospital, patients), fail (iffy on this), stepping outside of education/medicine to get a different team to rethink approach, Do what makes sense and not what has always been done. Healthcare is the biggest business in the world, and there's alot to disrupt. Another Break! Off to find other people! 12:00PM: We are moving into the third section of this conference, and talking about social media. Can reach patients, can reach students. Train students to learn to the story of illness, which is increasingly shared via SoMe. See past the disease and into the person. Getting away from cookie cutter care. Social media can bring individuals together, and power experience. Learn with each other and from each other. Expanding empathy via virtual beds. Good introduction on social media. 12:08PM: Yay! Pharmacy presenting on social media and pharmacy education Stuart Haines, University of Maryland. Social media is a mixed concept. Is any tech that can help communicate together then social media? Son's homework example of what social networks/media he could find, and the son found 64 sites. Shoutout to Mendeley and ResearchGate. Be interested in the educational goals of social media, and not the technology itself. I think thats a good point, sometimes we just get caught up in the tool and not the outcome and can quickly jump on different platforms with no plan. Need to to methodologically select the right tools and introduce in such a way for the desired outcome. Causes some thoughts on instructional design. Want competent caring individuals at the end of all of this after all. Understand the audience, and what is there levels. Conversation (e.g. discussion boards) can be stilted and tough when the tool is hard to use and new and, also forced at times. Millennials are abandoning FB due to the invasion for coopting the original purposes. Cannot co-opt tools for an educational purpose when meant for something else entirely. iFORUMRX need to look into this.... He's now hitting how using Twitter for back-channel means of furthering educational purposes. Substitution (can change things but doesn't necessarily change to much. Use twitter as a way to broadcast announcements vs blackboard), augmentation (new ways of doing things previous not possible. Students can write papers and notes, but can use a blog and wiki- you can monitor their progress and its a public sphere vs closed door papers), modification (using the tech to do things that wouldn't have been easier, example where twitter is used as an on call messaging service [instead of txt/page] and then using Google Voice for response for DI questions to simulate real world experience and get some outcome, Redefinition (Doing things unforeseen, using computers to design drugs and delivery without being previously perceived), SoMe is a tool to an outcome. 12:21PM: AJAY! Love that he's presenting. Love that he is talking about In-Training, and harken back to Ferguson, and their way groups were working together. Good example of how the reach of an article did a large showcase of solidarity. Stories and experiences in the beginning, but new articles coming out that were 'harder' in thought. I have watched this over the years, and I have been greatly pleased what Ajay has grown. I think students doing this activity is amazing, and leads to large amount of potential innovation. Can use social media to charge students to action (coming out of ivory tower) and encourage activism to a certain level. Coping. Interesting that is social media a good coping mechanism for students? A modern day cathartic mechanism. Grassroot community of being in medical education to learn and feel from one another. Ownership between the members and those that help run it. Institutional memory. Virtual space as the new whiteboard of communicating and sharing. He asks, how do we leverage this for collusion and training of future students? Some criticism and support for growth by administration and other groups to help them grown. Institution must have some support (rally around students) and safe space (fear of retribution and risk of aversion is key). 12:33PM: Berci is talking on the need to teach students on the rise of digital and impacting patient care, as fear that students may not be ready. Watson seems to be a popular topic in the past few days for me. He's showing alot of digital health devices and tools. In 2008 he started his own online curriculum. New skills for students, including digital literacy, good communication (online and offline are the same), assessing technologies. A new medical curriculum - Social Media, Mobile Health, Disruptive Innovations and how to be ready for all of this. I love his social media course via webcina. I like the fact that if they finish all the work online can skip the final test. Heh, he made a shark pool by giving points for those that work to finish the assignments he puts online everyday of the week via FB. Huh, he has a chocolate budget to reward his students. Wonder where that comes from in the department? Appealing to my history (grew up outside Hershey, PA). Digital is just an additional part of their life, and that we need to increase our skills as a human and that computing may replace somethings and we may deserve it as it will be needed. 12:45PM: Social Media Panel now. Good first question about how would we validate social media for accreditation bodies. What do students need to know? Issues is HIPAA and privacy and other issues. At the end of the day, will just scare away students, and lose engagement with students that are 10-20 years ahead of the faculty. EM and FOAMEd, love it. Schools are so damn far behind overall. Berci is aggressive in this sphere, but adaptability with other institutions may be difficult. Pharmacy schools are no different and we are struggling as well. Not about something shiny, but something here to stay. Moderator trying to pull this back, what does a student actually need to know. One panelist thinks Twitter Chats are key. Twitter may not be here in 5 years, but knowing how to engage in the realm realistically is something we need to teach. WE could debate books, JC, and other past tools that todays learners have moved on. We need to avoid disconnected educators. Reality is changing but we are clinging it. Stagnation is dangerous. Medical Futures Lab and Rice University -- Creating content is tough by students. I don't think all students can be creators. Sometimes (my view) the best to ask is them to be curators. Book recommendation "no Mans land(?)" we need to catch up to students. Good question on how to students learn. A good educator can help choreograph the students actions and lives, not a sage on the stage. What can we learn from patients on social media - help see patients as people. Social media can help build context for students on patient experiences. Ajay throws in now about pairing e-patients w/ students. Question now is security and etc. that scares educators away. This is gonna make a bunch of nervous deans. Online space can foster interprofessional space for health professions and students. This is a really remarkable conversation and debate going on. Students fear retribution and permission on public space. Ajay bringing in experience with in-Training that students was a safe platform to speak on. Students and patients want a say in the development of curriculum. Converse, do they have a good insight into what they are getting into? Good insight that not all students and patients want to be online, but clinicians need to be ready for those that are. Politics and twitter, are vaccination a part of the conversation? Can you be apolitical on patient issues? LUNCH! Sandwiches... meh. Some presenters talked about their teaching modalities in Singapore and in Europe. I really like the thought process of using no classes and just team-based work. 2:34PM: Cystic Fibrosis video, it's interesting hearing the thoughts about how social media can bring together people that should never be together, and have a collaborative support group online. 2:36PM: Bring on the E-Patients. Cystic fibrosis patient presenting on her experiences. Hacked the biomedical research system. She can either wait and pray for a miracle, or engage in her own salvation. Collaborated with researchers and industry to raise awareness and treatment possible. She hopes to engage in an N=1 study to see if she can find treatment. Personally, for me this is an interesting development in drug development and the waves are crashing against traditional research modality. 2:41PM: Huh, Penn State Medical School, again, grew up around there, small world. In any event, introducing the idea of medicine is emergent and improvisational. Now I am listening to Jazz.... Piano trio he is discussing. Think this is his leadin on working together. Assessment of interprofessional practice and how each part plays their role. Jumps into the difference in roles shifting in Jazz and how the music changes. Does this change practice as well. What if all three all did the three parts? Song is "Waltz for Debbie." Showing three different versions. This is a good way of introducing interdiscplinary training in medical education. You can't listen if you don't value the other perspective. Need to develop attitude and skills, understanding and listening. 2:50PM: Innovation in interprofessional education with students. Example of social worker and pharmacy students working with physician. Vanderbilt Program in Interprofessional Learning (VPIL) over the course of two-years working together. Rather interesting premise to create interdisciplinary teams. Medicine, nursing, physician, and social work together in one team. Helps understand what each other is thinking. Each one picks up on different things that the other may not see. ECO-MAP. Positive vs Negative thought process. I REALLY REALLY LIKE THE VIDEO SHOWED. I need to show this to my faculty to be honest. Students seemed to enjoy the learning experience. Goals are to cultivate, prepare, improve, integrate, and nurture students. Move beyond shadowing and towards interdisciplinary work. The classroom allows them to come together and talk about their experiences. Week long immersion over the summertime before their professional curriculum courses start. Learn about each others professions, and team work and thoughts. 3:07PM: New lesson, set stretch goals! Heh. Looking at treatment and medical interprofessional care across other regions. Looking at Sub-saharan Africa as a region. Be more afraid of people not getting your message than what they think of you. We need to do a better job of learning from others. Its interesting the comparison to an uncompromising environment. I like the shoutout to world pharmacist day and the case studys. FIP - Education Reports on Pharmacy Interprofessional. I like the comparison she's making between elephants from circuses trained to not escape, and African Elephants which are free. The elephants are the pharmacists in the room. HAHA. Namibia are working together to solve health disparities. Sick patients really focus the mind on important things. Tim Rennie. Gave an opportunity for pharmacy students to be collaborative and expand services. (Wont lie, took me awhile to warm up to this presentation, but now I love it). Interprofessional curriculum and Professional Curriculum. Maybe we are thinking the wrong way trying to have them both all the time. They are using mobile for interprofessional learning. I like this, and need to read into this. More. 3:20PM: Panel Time on Interprofessional! Can VIPL have a patient? Yes. Patients come in as mentors for patients. Students are asked to work with patients and follow them through the whole visit to understand the visit and experience and how the system impacts them. What does a successful interprofessional team look like? Patient is part of the team, and understanding each members role. Ultimately has to be a captain and the patient doesn't have to put it all together. The captain can help lead and partner with the patient. Patients expect that teams are much more interprofessional than what the system actually is, just as students think that they would naturally work together and train together. You realize how disjointed things are when something goes wrong in a crisis. Challenges is getting students together from different backgrounds (This is a common question/issue I hear from other institutions looking to implement interprofessional education goals). Everyone's curriculum has a little fat to burn off... But now everyone needs to cut something good out of their program for the chance of something great (interprofessional goals). If we only see roles and not human beings then nothing changes. "Are you internal medicine?" I think alot of good thoughts, having students eat together and spend time together instead of siloed is important. Patients need a bigger say and involvement. Can we just put classes together if overlap? Of course, the registrar may hate it, for a class to have credits for 2 different (or more) professions. Competency is important. Students can do alot, and students can generate alot. I suppose the question is whether the faculty can come together and back it up. We should be excited about the differences in the professions. 4:05PM: Video on E-Patient with Lupus. Sad hearing about being advised to drop out of school. She starts looking into it. Millennials with chronic diseases seem to be leading alot of the work in this area to a certain degree. Chronically ill students need an advocate for the school environment. 4:07PM: Introducing the e-patient on Lupus. Told to leave school. But then what? School is what she knew and what she strived for. Empowered patients know what they want. Empowered patients become experts in their own health. Providers need to know what the patient wants as well. Get to know the patient, and spend time with patients. 4:13PM: Scripps Health. Certified Doctors = Certified Beef. Nice analogy. Ooooh, getting into the debate on the whole issue of certifying testing? Cost is huge. Hard to tailor to individual practitioner. Used to be every 10. Now Maintenance of certification (MOC) every 2 years. Posted a petition to rescind new requirements. He got alot of signatures. I have heard about his a year ago with the drama going on. Its a money making item from some comments and debates. There is alot of data, but not for MOC. He's pointing out some COI in post education. Everyone says we need more data. What ever quality data will we get? We aren't going to randomize. Always going to be registry data. Maybe we don't need alot more data. Some thoughts about making another national board [of physicians and surgeons]. Going the CME route, and not for profit. Board members are not paid. Simple application. ABMS and ABIM are now in conflict. Due to Social media over 2,500 physicians are now certified. NBPAS.org. supports lobbying power for hospitals. Physicians can put the horse back in the barn and take back leadership. 4:25PM: Is CE a cognitive process? Cognitive Dissonance. We need to help learners move from working memory to long-term memory. Adult teaching theory. Maybe everything we done is necessary but not enough. Do learners know how to learn? "How do learners learn" Research project. What actions do learners take to actually learn. 1. What are the actions? 2. How and when are they used? 3. Do they work? Went out and interviewed 300 clinicians. What strikes you that you need to learn (cognitive dissonance). Four primary themes of learning. -- 1. Note Taking (not an event but a process) 2. Reminders (only as important if we refresh and reuse it- You may think you will go back and look at it, but probably not) 3. Search (not all of the information you need is important -- Mindfulness of time -- lets say we were talking about a study, but when we get to inclusion/exclusion you may go on a tangent while being taught, the learning process is fragmented) 4. External Nudges (Due to all of the different strategies the educator plays a large role in nudging the student back to attention "Maybe you want to write this down... The following is important..." need to then related back to each other. The how and when came up next. Habit and convenience versus Trial and error. No trial and error in the way we learn. Do the actions that learner take (largely as a action of habit and convenience) ultimately help them. Best case is yes it works, but if not we are in trouble. How do you interact with content actively as you 'learn' it? We need to question the environment of learning. Take away: We are relying on these learning actions. Can help us work smarter and not harder. We need to acknowledge that each action may act an accelerant to learning or a barrier. We are the architect on the learning experience. Less PP and more on presentation to learn. 4:38PM: Panel Time on lifelong learning! CME and experiential learning. Sorry, notes on this section will be static as I got distracted by another issue (don't you hate that?!). Feedback is important. Finding data is key. Patients/advocates helping to teaching practitioners on habits? To practice is to learn argues one panelist. Another panelist points out we never learn how we learn. Not a learning style conversation, but competence issue. Effectiveness of learning is different than efficiently of learning. Patient advocates as risk management, or a safety net. Trying to find a good solution for learning. Opps, patient advocate graffe? Think theres going to be some conversation on this. How can we make life long learning a reality? Patients and doctors getting to learn from each other, but someone gives and someone has something to give. Build a culture where the clinical sphere is not just a job. As clinicians we need to see our sphere as not as where we do our job well but where we learn as well. What one thing am I working on today? Classrooms are poor ways to learn, but the hallways are good. Multiple choice is out of date. Need more patient based. 5:16PM: Wrap up time, Dr. Chu coming up to speak. O look, a survey coming to us! Want feedback. Wonder if anyone mines this for scholorship. 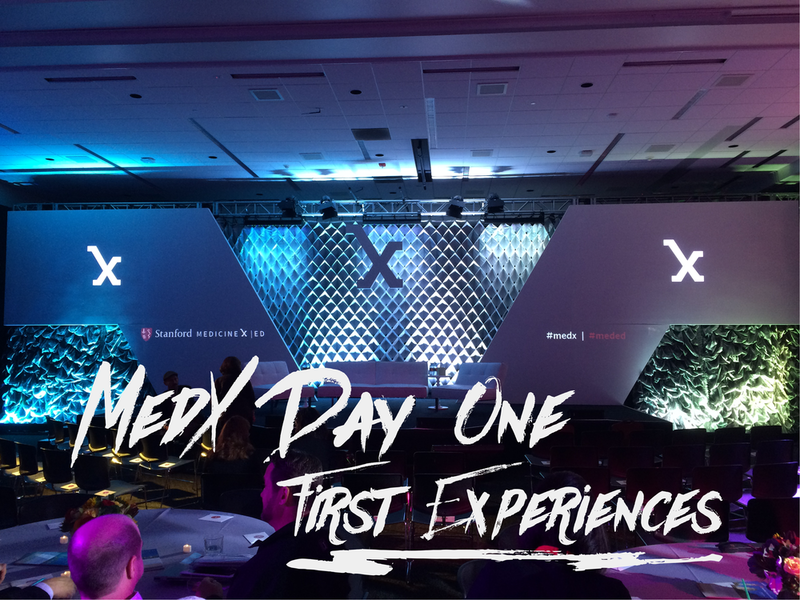 No chocolates, whoever completes both days will get a free registration for MedXEd next year. I will see what workshops I have tomorrow. Bringing up to stage everyone who played a large role. Nice to see the effort that goes into this. 5:22PM: Abrahm Verghese is going to speak now for the closing keynote. Vice chair on the theory of practice of medicine. Beginning talk on the issue of the educator of Helen Keller and her rough upbringing. Annie Sullivan training of Helen Keller. Breakthrough came with w-a-t-e-r moment. I think we all strive to achieve this in our students. That awe in their eyes as it just... clicks. Our greatest moments of epiphany are sometimes just with ourselves though. Now jumping to William Osler - he has shaped so much in american medicine. One of the founding physicians at John's Hopkins. Osler wrote alot about medicine and teaching. The physical exam (auscultation, percussion, etc) followed by reflection (get this picture of Osler) and then there is that famous picture "the doctor.' Social importance images were important at this time, and the doctor of that time was one of reflection. The artist child had actually died on Christmas Eve and was the motivation. Slogan "Don't let the government take the doctor out." Speaker does not agree with interpretation of doctors. The picture is us projecting ourselves into the child at the center of attention. "Bible" reference you clothed me and fed me "I was ill and you fed me...." Matthew. Fear if this image was redone, it would be on the computer. What is the doctor of this day. Rounding with patients and table rounds. Schwartz rounds. Conference room rounds and we face our computers. Its not the doctors fault, its our fault as educators. This is impacting physicians (and healthcare at large) with burnout. More time with a computer than with a patient. 4000 clicks over a shift. Physicians are spending more time logged in and online on the computer. Hard to discern with new data, when the doctor actually sees the patient. Mobile is ubiquitous in our communication. Sometimes the answer is right in front of us, but we dont grab it and failing to read the patient. We are failing to perform a physical examination and causing errors. Upcoming publication "Inadequacies of physical examination as a cause of medical errors and adverse events: a collection of vignettes" since no one examined the patient. Losing a ritual of medicine -- being with a patient --- ritual helps us with crossing of a threshold and helps as a binding action. We shortchange our patients when we dont do the ritual well. Do not cement the bond. What is the pharmacist ritual I wonder, did we lose it with compounding. Good image with apprentice in Indonesian sword maker. Interesting the art is dying. Are notes fiction? Should not be in the medical record. Stanford 25 website. Medicine is a very human experience. Nurturing function of medicine. Need to be there for our students. "dont dig because there is no gold there" on the exploration of the spleen - Let the spleen palpate your fingers and not the other way around. Galen, Hippacrates, Osler, all are models. Hope you found this helpful! I will most likely sit and reflect and write a wrap-up in a week after finishing tomorrows workshops.